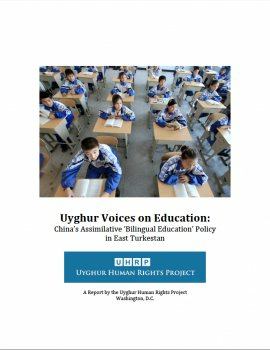 The Uyghur Human Rights Project (UHRP) announces the publication of Uyghur Voices on Education: China’s Assimilative ‘Bilingual Education’ Policy in East Turkestan. Since UHRP’s first report on bilingual education in 2007, the Chinese government has accelerated and expanded an education policy that has effectively marginalized the Uyghur language from the education system in East Turkestan. The ‘bilingual education’ policy is designed to transition Uyghur students at all levels from education in their mother tongue to education in Chinese resulting in the removal of Uyghur in the classroom and presenting a fundamental challenge to a distinct Uyghur identity. Since the 2014 Work Forum, Chinese officials have placed ‘bilingual education’ at the center of its efforts to achieve “ethnic mingling,” an initiative that aims to blur the cultural distinctiveness of the Uyghur people and assimilate Uyghurs into the Chinese nation dominated by the Han culture. “China's bilingual education policy as implemented in East Turkestan is not bilingual at all. In practice, it is a monolingual Mandarin education. Its intent is to annihilate the living Uyghur language and eventually assimilate the Uyghur people into the Chinese culture, thereby eliminating the status of the Uyghur people as the original, indigenous and dominant people in East Turkestan,” said UHRP director, Alim Seytoff in a statement from Washington, DC. Uyghur Voices on Education: China’s Assimilative ‘Bilingual Education’ Policy in East Turkestan offers four accounts by Uyghurs reflecting on their experiences in the Chinese education system. Each account presents a different aspect to the ‘bilingual education’ policy including: loss of cultural identity, lack of employment opportunities, ethnic discrimination faced by Uyghur students and teachers and the effect of mergers between Han and Uyghur schools. UHRP is extremely grateful to the Uyghurs who shared their accounts for Uyghur Voices on Education, as the descriptions present a stark contrast to Chinese government rhetoric. Chinese officials have portrayed the Uyghur language as incompatible with modernity. Following a pattern of broader development policy that has promoted the adoption of Han civilization as central to modernization, China has moved to diminish the status of the Uyghur language in society. The Chinese government has stated that by 2020 almost the entire non-Han Chinese student population will be educated in ‘bilingual education’ schools. In a further comparison with broader development policy, Uyghur participation in devising ‘bilingual education’ was absent. As the report describes, despite strong Mandarin skills, Uyghurs are much more likely to struggle in finding employment compared to their Han counterparts due to endemic discrimination in the hiring process. Furthermore, conditions in Uyghur schools fall far behind Han schools with noticeable differences in funding and class size. UHRP researchers also describe how Uyghur teachers have lost their jobs as the government aggressively pursues ‘bilingual education.’ The shortage of teachers in East Turkestan often means unqualified Han instructors are hired to fill the gap. The implementation of the mainland class program, in which Uyghur students are educated outside of East Turkestan, aims to assimilate Uyghurs and promote the value of ethnic unity amongst the participants. However, as Uyghur Voices on Education relates, the program has limited success in promoting unity. Students often encounter racism in the program, and upon graduation, have difficulty finding work and obtaining permits to remain in interior China. Schools (classes) and other educational organizations recruiting mostly ethnic minority students should, whenever possible, use textbooks in their own languages and use these languages as the media of instruction. States should, where appropriate, take measures in the field of education, in order to encourage knowledge of the history, traditions, language and culture of the minorities existing within their territory.